Trees play an important part in the world of slacklining. Their health and well-being must not be overlooked. Trees may seem strong and indestructible. However, damage to the bark can cause even the strongest trees to suffer or die. Through breaks in the bark, which is the tree’s skin, insects and other pathogens can cause infections and disease. If there is significant damage to the bark, it can affect the tree’s ‘circulatory system’, which is directly beneath it and carries the energy produced by the leaves to the rest of the tree. This is why it is massively important to use tree protectors between your slackline and the tree. As slacklining becomes more popular and widespread in parks and public spaces, the rule-makers will be looking at the pros and cons of the sport on which to base their rules. If us slackers are seen to be responsible users of our much-loved trees, then hopefully we can continue to use them, in parks and public spaces, with everyone’s approval. Introducing the NEW Maverick tree-PRO! Coming soon to our product range. We are pleased to announce that we will be including a FREE tree-PRO set with every pre-order of the new Maverick PRO-SYSTEM placed before the 1st of November. 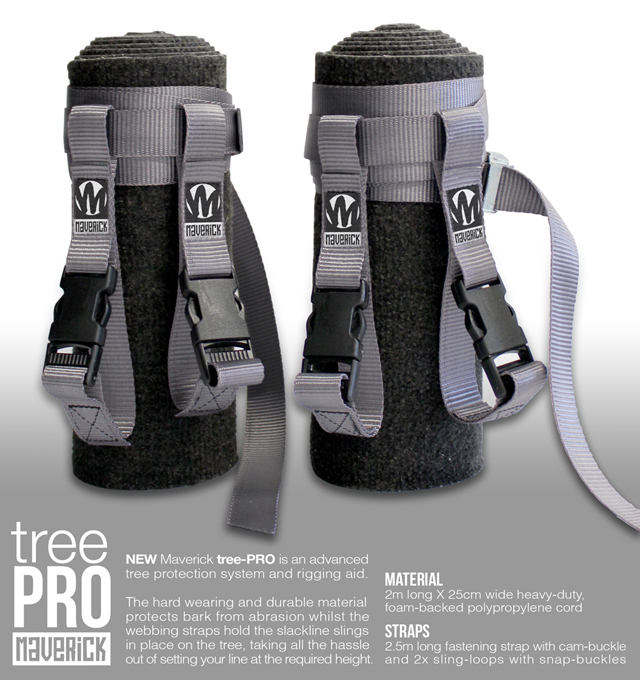 NEW Maverick tree-PRO is an advanced tree protection system and rigging aid. The hard wearing and durable material protects bark from abrasion whilst the webbing straps hold the slackline slings in place on the tree, taking all the hassle out of setting your line at the required height. Hey I agree totally about the tree health being inportant and using tree protection but where can I get this ? or can I just make one ? I think the proctection of the trees is really important and people will stop you using their trees if they get damaged by fellow slackers. If they don’t use the tree protection they will also damage the line as well so you might as well use some protection. I have just bought a slack line and they cost a lot of money just to ripped by a tree.